If you’ve visited a community museum anywhere in Ontario, chances are you will recognize many of the artifacts featured in this online exhibition, all of which are from Halton Region Heritage Services’ collection. In their early years, historical societies and community museums collected a relatively standardized and not particularly diverse set of pioneer and Victorian wares with abandon, which have had a heavy bearing on modern museum collections. Across the province, museum storage facilities are full of domestic wares like doilies, butter churns, apple peelers, tea sets and wood planes. The impulse to preserve a rapidly disappearing past and recreate idealized scenes of ‘pioneer life’ saved many historical objects from oblivion (and started many a community history museum’s collection), but this impulse did not always extend to saving the histories and stories that accompanied these artifacts. We know what the items are, but not necessarily who made them, what they were used for or their geographic affiliation. The objects themselves sufficed for early community museum displays, largely consisting of historic room settings, designed to invoke reverence for a romanticized past. In these situations, the artifacts spoke for themselves and received little interpretation beyond a label identifying the object and its donor. 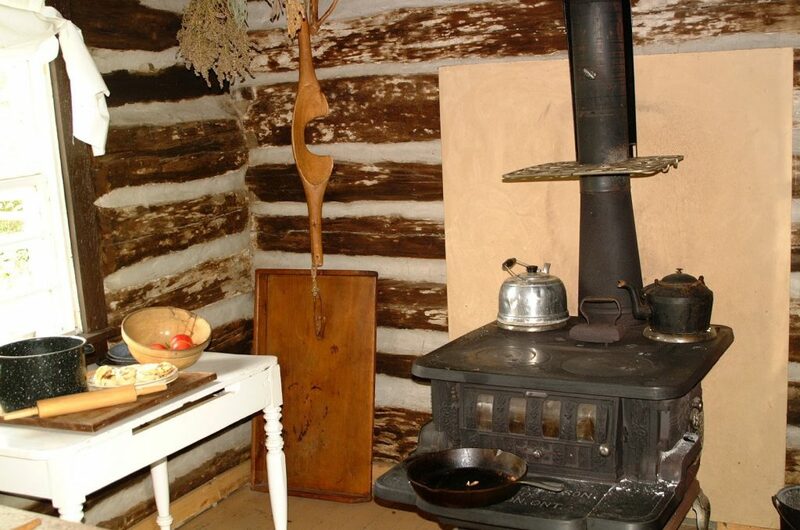 A typical pioneer cabin display, Halton Region Museum, 2006. As museum practices have evolved, striving for a more inclusive, diverse representation of history and local stories, we want to connect these singular objects to a wider historical narrative. This process can be challenging, both due to the lack of information about objects in our collections and the fact that the early collecting practices were uneven and excluded some communities. How can we use these objects, painstakingly saved and preserved by early historians and curators to inform today’s historical scholarship and learning in a more holistic and inclusive way? In the past, many of these objects have been used to present narrow, sometimes biased pictures of history (notably, depictions of Indigenous people and women). Increasingly, museums are working to use these objects to tell a wider, more multi-faceted story and even highlight past oversights and questionable historical portrayals, opening up discussion of museum practices and how they can be more inclusive and responsive to their communities. The professionalization of the heritage field and the emergence of a more visitor-centered museum have diversified collecting and interpretation practices, while vastly improving collection research and documentation. Now collecting aligns with provincial standards, institutional missions, strategic and interpretive plans and is more focused and methodical. While we still have the butter churns, the wood planes and the tea sets here at Halton Heritage Services, looking at these objects through fresh lenses and as part of a larger history, along with modern avenues for research and making connections can give them increased relevance, a more diverse audience and a new life within the museum and the community. There is still much work to be done to make museums responsive, representative and relevant to our modern society, but rethinking and reframing our collections is a good place to start. The centrepiece of Flights of Folly: Learning from the Passenger Pigeon exhibit at Halton Region Museum was a taxidermied specimen in the Museum’s collection, but the exhibit addressed far more than just the pigeon. 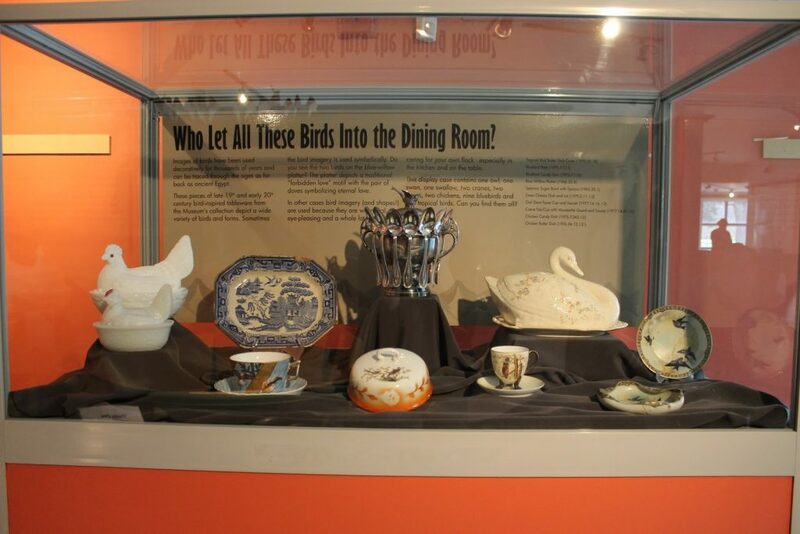 The 2014 show spoke to issues of environment and conservation, while using items from the collection (such as the china pictured above) to illustrate the themes and provide opportunities for visitors to make connections between history and their own lives. Photo from Halton Region Heritage Services. When Halton Region Heritage Services embarked on this online exhibition project with Active History, we asked our staff to select any object from our collection that they would like to take a closer look at, in the context of the wider history of Halton Region and Ontario. On their surface, these objects from Halton Region’s collection look rather pedestrian and unremarkable, but as our contributing authors have uncovered, the featured artifacts tell important stories about life in Ontario over the last century and also connect to our present-day lives. We invite you to explore this small sample of our collection and discover just a few of the multi-faceted artifacts that live in many community museum and historical society collections around the province. What is Halton Region Heritage Services? Halton Region Heritage Services located in Kelso Conservation Area in Milton, Ontario. In June, 2014, Regional Council approved the Halton Region Museum Master Plan which details a long-term plan and vision to transform the Halton Region Museum into Halton Heritage Services. The Master Plan outlines a new and innovative model for the delivery of regional heritage services in which the Museum will not only continue to care for the Region’s own collection but will provide professional services in exhibit planning and design, public program development, collections management and artifact conservation to regional heritage and cultural partners. With this concept in mind, the intent of Heritage Services is to strengthen existing attractions and create a coordinated network that tells the Regions’ stories. Halton Region, as we know it today, is rich in the history and modern traditions of many First Nations and the Metis. From the lands of the Anishinabe to the Attawandaron, the Haudenosaunee and the Metis, these territories surrounding the Great Lakes are steeped in Indigenous history. As we gather and work on these treaty lands, we are in solidarity with our Indigenous brothers and sisters to honour and respect the four directions, lands, waters, plants, animals and ancestors that walked before us. We acknowledge and thank the Mississaugas of the New Credit First Nation for being stewards of this traditional territory.